Art Camp 504 offers fun and inventive workshops that emphasize our unique art and culture of New Orleans. Our mission is to shape the next generation of innovators and creative problems solvers by giving young artists the skills and confidence they need to reach their innate potential. We inspire students to think outside the box by teaching experimental art forms and mixed media across disciplines. Our curriculum builds confidence and self-esteem, and challenges young artists to get their creative juices flowing. Each workshop begins with a short, whole group lesson, and the majority of time is spent in studio. We believe in empowering kids to run their own work time - students know what they are working on, where to find materials and how to manage them, and they keep their studio space organized. Teachers guide and assist students, demonstrating techniques to help students achieve their creative goals. By including a large variety of ages in our workshops, we foster a culture of collaboration and openness. Younger students learn from and look up to older students, and older students take on leadership roles, challenging themselves to grow and develop as young adults. Our campers work together and support each other through the entire creative process, while learning how to connect and relate with younger and older students. SUMMER CAMP - Explore your creativity while learning visual & performing arts skills this summer! Ages 5-14, June 3rd - July 26, @ Tigermen Den and Art Klub, 8:45-3:15, aftercare available. $225/week. REGISTRATION NOW OPEN! WINTER FILM CAMP - Build your creative storytelling skills through conceptualizing and producing your own short film. Dec/Jan Winter Break camp, 8:45am-3:15pm, Ages 7-14. Registration opens October 2019. Our program began as a four-week summer camp in 2016 with 35 young artists. We now offer 16 total weeks of summer camp at the Tigermen Den in the Bywater and Art Klub in St. Roch, a two week Winter Film Camp, and various after school and weekend workshops throughout the year. We believe that high quality art education should be accessible to all children in New Orleans. Our Rising Artists Scholarship Program offers income based financial assistance to our families. Email us at ArtCamp504@gmail.com for more information and to apply. Built in the 1830s, the Tigermen Den is an inspiring preservation of a Creole dry goods corner store. The building had last been commercially used from 1964 to 1992 as ‘Ms Turner’s Soul Food Restaurant’. $2.50 lunch plates were served to dock workers stationed a few blocks away on the Mississippi River. Between 1992 and 2010 the building had layers added and removed but never opened for business. In 2011 an all female local band ‘The Tigermen’ moved into the apartment upstairs and rehearsed downstairs. The band referred to the building as The Tigermen Den and the goal of becoming a community arts and events space was ignited. The barge board that was used to build the walls was taken from 300+ years old trees and was originally used as boat bottoms and to build homes all over the Bywater. Today, the Tigermen Den is used as a space to gather and to celebrate life and all its amazing journeys. The space that would become Art Klub began in Spring 2015. Instantly inspired by the building's potential and the warmth of the neighborhood, Art Klub felt a vision begin to unfold. The former grocery store, body shop, bakery, residential home began massive renovations. Today it exists as an art and culture community center providing opportunities to connect, create, and grow together. The Art Klub family is committed to offering a safe and inclusive space, cultivating creativity and engaging communities through artist residencies, performances, events, affordable rehearsal and meeting spaces, classes, workshops, and community programming for all ages. Art Klub’s primary aim is to reach audiences with intelligent, highly professional, poignant and human works of performance and art. Art Klub is a culture of education, inclusivity, anti-oppression, non violence, well being and peace. 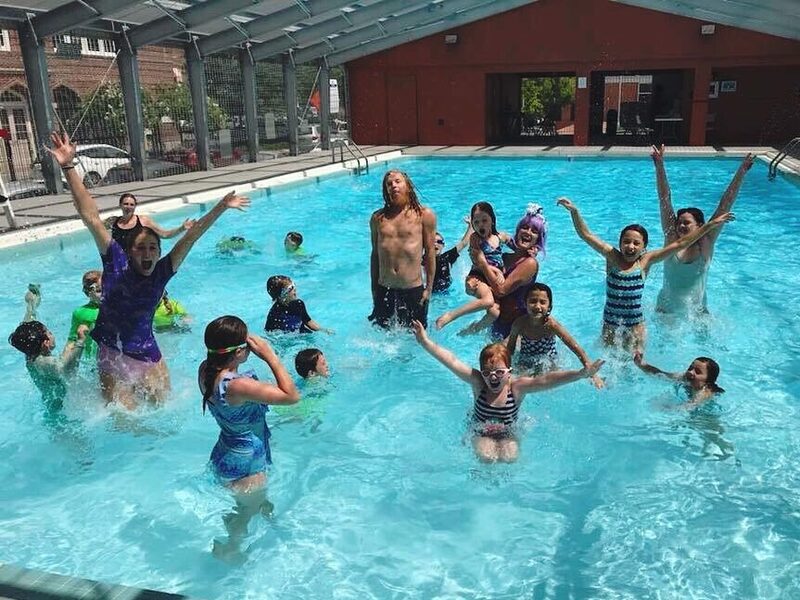 Thanks to our partners at NORDC, we bring our campers to Stalling Pool on St Claude twice a week for open swim. Art Camp 504 has a one hour time slot on Tuesdays and Thursdays. Transportation is provided through our partners at New Orleans Kayak Swamp Tours. We love our swim time!